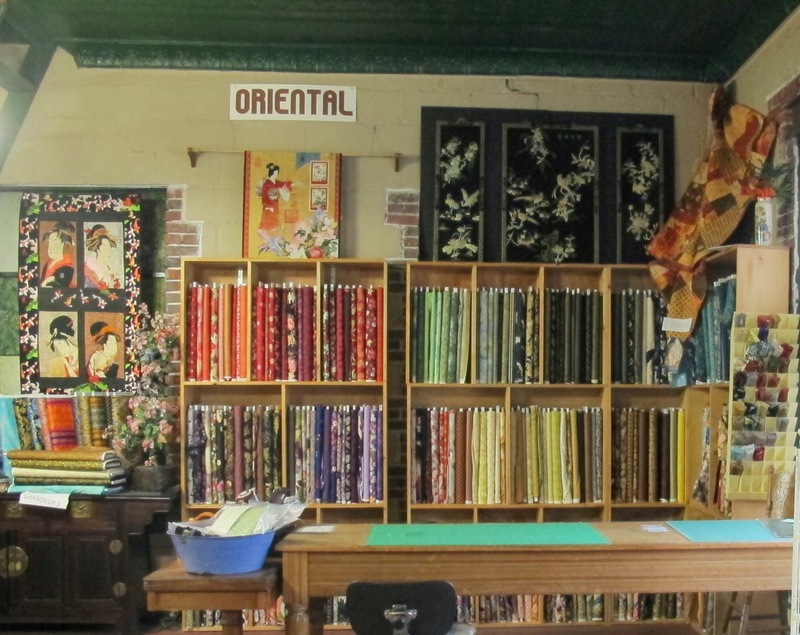 On a tip from another quilt shop owner in the area, my friend Hilda and I traveled to Trenton, FL to visit The Suwannee Valley Quilt Shop. We were in for a real treat. 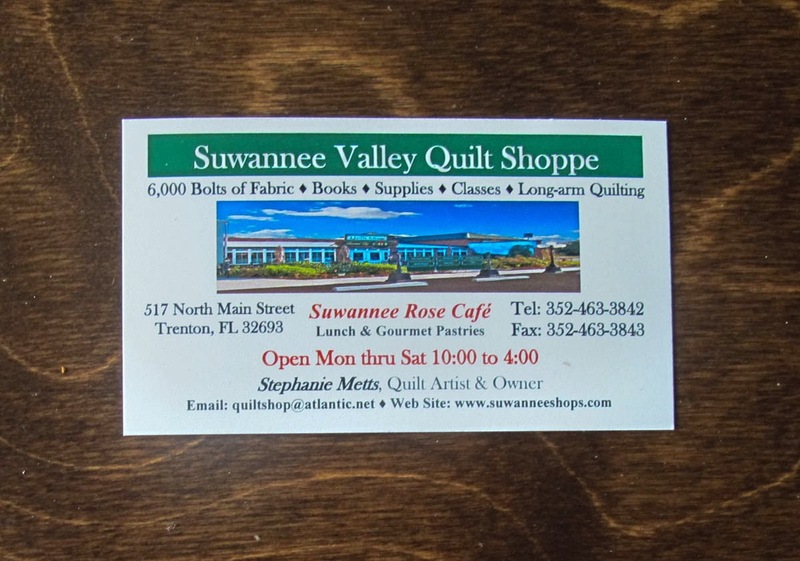 Trenton is a very small town indeed but The Suwannee Valley Shops make it worth a day trip. Sorry the picture of the shop exterior is not the best, but it was a very stormy cloudy chilly day. It rained buckets while we were in the quilt shop. But we didn't care 'cause we were having a great time warm and dry inside. The shop is owned by Stephanie Metts who was gracious enough to consent to photos and a blogspot about her shop. Boasting 7000 bolts, the shop is located in a charming restored historic building. There is a large central room with several other rooms branching off each with a "theme". 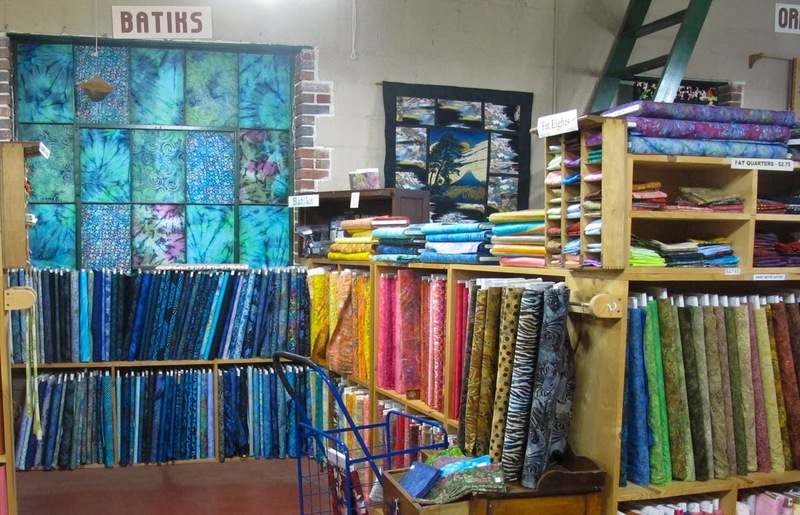 As seen in the photo at the right, there is a generous selection of batiks, a favorite of mine. 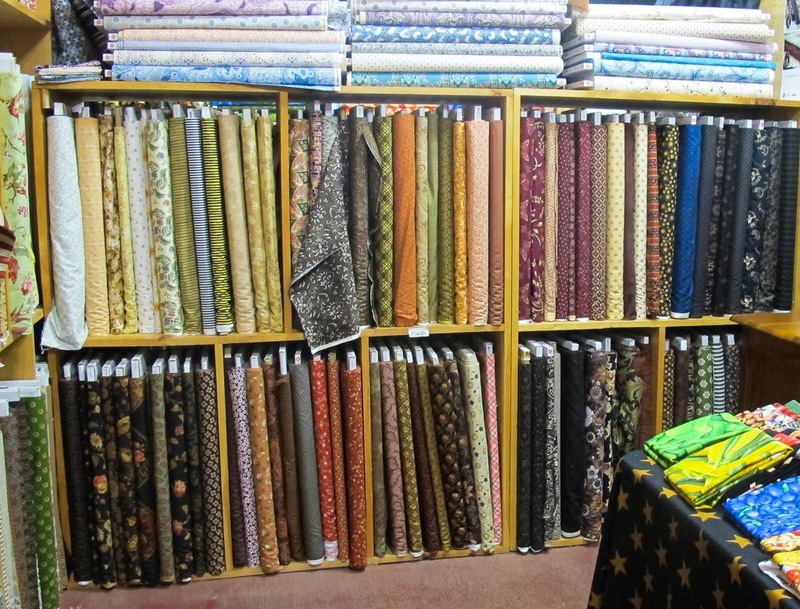 The area pictured at the left also contained Civil War and Downton Abbey fabrics. Yes, Jane, there was a nice selection of your favorites. In the daylight filled open area at the far right end of the shop there was a comfy lounging spot for hubbies or tag-a-long non quilting friends. Here the left wall featured Orientals and the right wall opened into a room just for blenders and backings. From there you entered the batting room. If I remember correctly, that opened into a children's fabric room. So many rooms, my mind is getting fuzzy! My kind of brights here. Located in the central cutting area. Below is a shot of the books and patterns room. 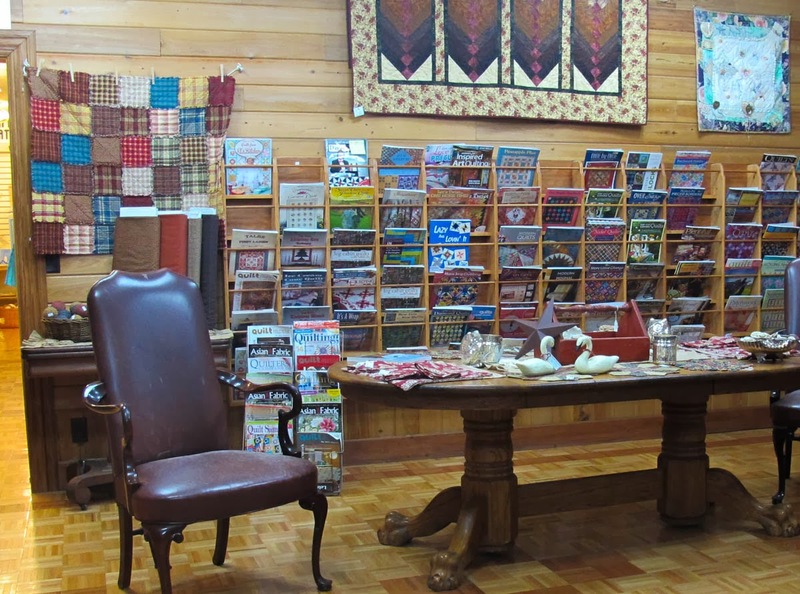 Yes, a whole room dedicated to books and patterns! And with a large table and comfortable chairs so you can give your feet a rest while browsing and making your purchase decisions. This is the best area of its kind I have ever seen. Here is a favorite of mine. 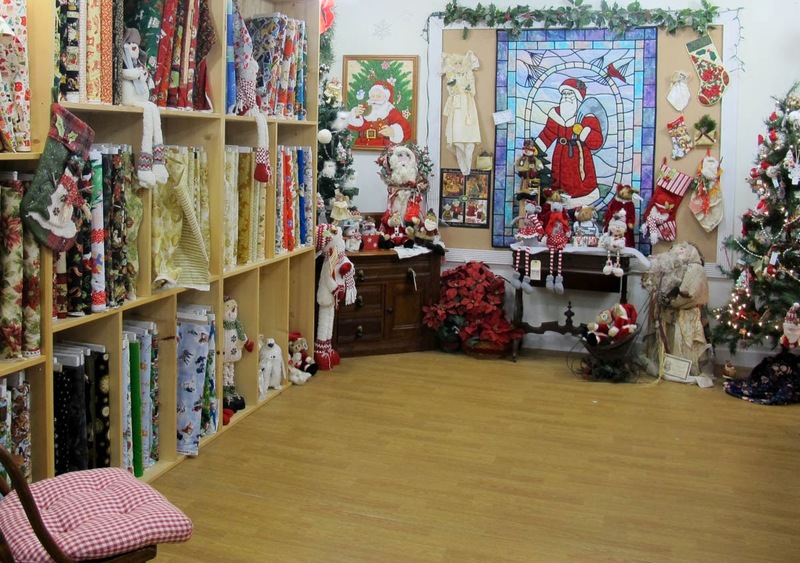 The room with Christmas and other seasonal fabrics. Isn't it cool! Year around Christmas shopping. Lots of autumn and patriotic fabs on the opposite end of the room. We topped off our shopping experience with lunch here in the Suwannee Rose Cafe. 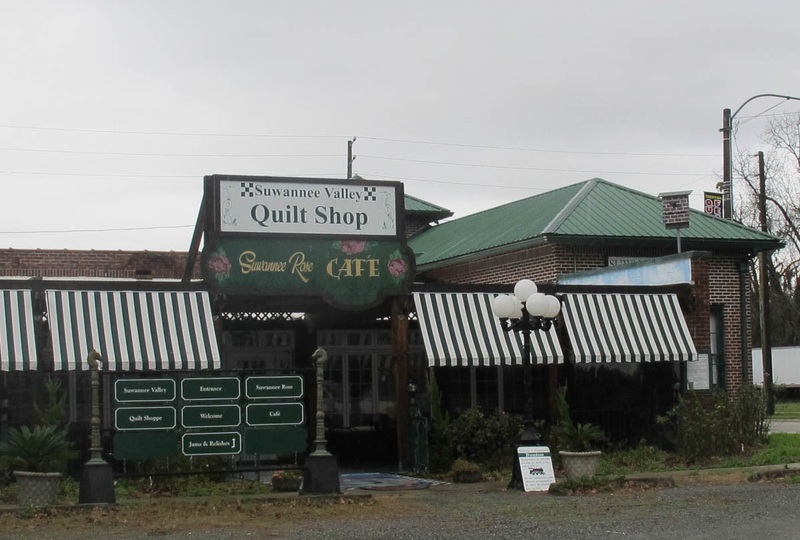 You actually walk through the center of the cafe to enter the quilt shop. I had the Crab Quiche and it was delicious. Hilda bought some cookies from their yummy looking bakery case to take to our guys who were hanging out back at the RV park. The Happy Days Old Tyme Soda Fountain is also right there in the building if you're in the mood for an ice cream concoction. 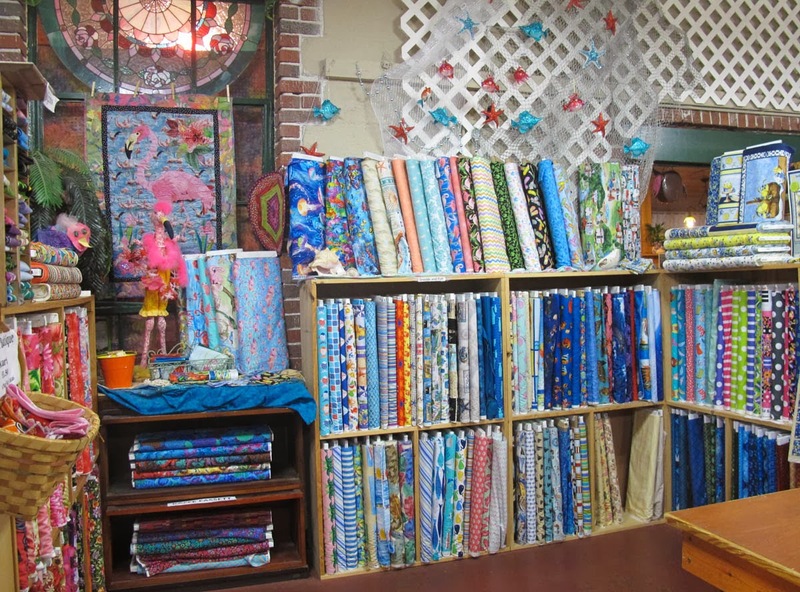 And while you are eating that, you can take a look at the quilt shop sale racks at the back of the room! The quilt shop's business card so you have all the specifics to find them. There is still more to do in Trenton once you have bought more than you needed to for your stash and had a delicious lunch. Right close by is the Suwannee Valley Cross Stitch. Located in the same building is Suwannee Valley Custom Framing and Suwannee Valley Stained Glass. We visited here and enjoyed ourselves tremendously and both made purchases. Delightful owner, don't miss it. We ran out of time but there is also Ann's Antiques & Collectibles that I would have liked to have popped into. 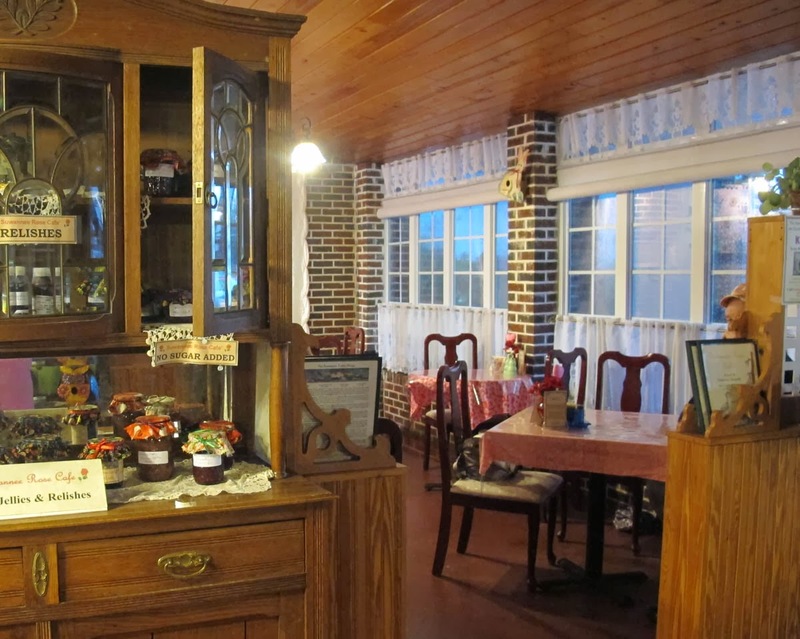 If you can be in Trenton on a third Saturday, you can enjoy a formal tea at the Ruffled Rose Tea Room by reservation only. These businesses and more are all located in restored buildings next to the historic Railroad Depot. 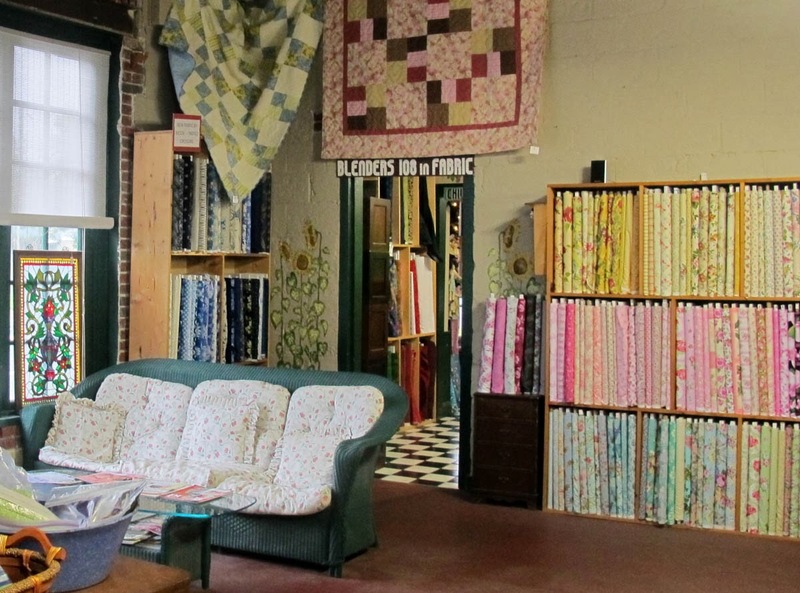 So you can see why I say that Trenton has a destination quilt shop! My photos don't do it justice and there were lots more shelves I could have added pics of, but you get the picture!